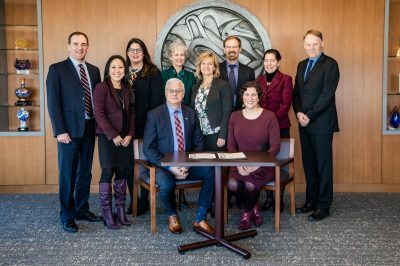 On March 8, 2019, International Women’s Day, Vancouver Airport Authority announced that Craig Richmond, president & CEO, had signed the Minerva BC Diversity Pledge, a public commitment to achieve gender parity in the workplace. With this pledge, Richmond joins CEOs from around the province that have also pledged to help support and empower women as leaders in their respective organizations. In 2015, Minerva BC, a registered charity, released the Face of Leadership BC Score Card, a report measuring gender diversity amongst the largest companies in the province. The program has since expanded with additional initiatives designed to help narrow the gender gap, including the Minerva BC Diversity Pledge, an Inclusive Leadership Forum and Executive for a Day, where emerging leaders have a unique opportunity to spend a day with a CEO or senior leader. Vancouver Airport Authority continues to champion women in their career paths and to date, women account for more than 40 per cent of the management team, 60 per cent of the officers of the Executive Team and 50 per cent of the Board, including the Board Chair. ​ Since 2014, ​the Airport Authority has sponsored the Women in Management program—an initiative that promotes and supports the advancement of women in the workplace. In previous years, YVR has hosted bi-annual meetings for the program on intercultural approaches to gender literacy and unconventional career paths for women. In 2017, the Airport Authority’s Women in Management program launched Women’s Development Circles, a series of group conversations targeting women in non-management roles. Women participate in discussions moderated by a woman in a senior leadership role and have an opportunity to explore a wide range of topics from work-life balance to tangible career advice.